As I mentioned last time, this post is going to cover Frederick, Adrian, and Jason Masters from Bryan Davis' Tales of Starlight series. Mr. Davis was kind enough to do an interview on this blog, and I have also reviewed some of his other books, including the Dragons in our Midst saga and the Dragons of Starlight series. He truly is an amazing Christian author. Tales of Starlight and Dragons of Starlight are two series that follow the Masters brothers Frederick, Adrian, and Jason, as they join the illegal Underground Gateway, intent on freeing the human slaves that toil under the dragons' tyrannical rule on the far-away planet of Starlight. In the Dragons of Starlight series for young adults, teenaged Jason took a job as a bodyguard for the governor and ended up getting swept into the Underground Gateway. Unsure whether to believe the stories of human slavery, he was forced into his quest as his entire life came crashing down around him. Follow this link if you would like to read my synopsis and review of the series. The Tales of Starlight series is technically classified as "adult." It followed Adrian Masters, who had been involved in the Underground Gateway from the beginning. Eager to free the slaves and find his older brother Frederick, Adrian did not share Jason's reservations. He risked everything to travel to Starlight and bring the captives home. Accompanying him was the master swordswoman Marcelle. Emotionally scarred after a strange man tried to take advantage of her mother and left her dead in the woods, Marcelle swore she would never be helpless again. As a noblewoman, she had access to the very best teachers, and soon became one of the most skilled swordfighters in the province. Like Adrian, she was determined to destroy the tyranny of the dragons on Starlight, and accompanied him to that strange and dangerous planet. Adrian was not pleased with his assigned companion. She was a formidable fighter, but in his opinion, used her strength in situations where she should use her head. He hoped to learn the dragons' weaknesses and overthrow them once and for all, but Marcelle could not abide the abuse the dragons performed. She would charge ahead to defend the slaves. The conflict between his strategy and her passion caused much of the trouble in the first book. After finishing the Dragons of Starlight series, I came to love Tales of Starlight as well because it expanded the story. Unlike Dragons in our Midst and its sequels, which added to the story by adding more adventures, Tales of Starlight improved Dragons of Starlight by showing the actions of characters who were important, but in the background. 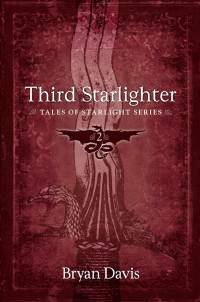 For example, in Starlighter, Dragons of Starlight book #1, we experience the story through Jason's eyes. However, in Masters and Slayers, Tales of Starlight book #1, we get to see how Adrian, Marcelle, and others manipulate the situation around Jason in order to bring about their own goals. 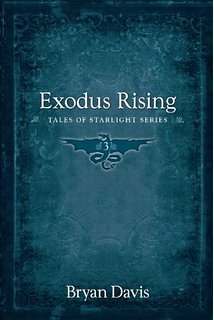 Although Tales of Starlight would suffice as a standalone series, it becomes much more rich and beautiful with the addition of the Dragons of Starlight series. They were both written for the same general audience (YA), but since Tales of Starlight focuses on adult (not teenaged) characters, by standard convention it is classified as an adult book. I would recommend both series for adults and teens. However, since the stories are intertwined, it can be a bit difficult to figure out which order to read them. 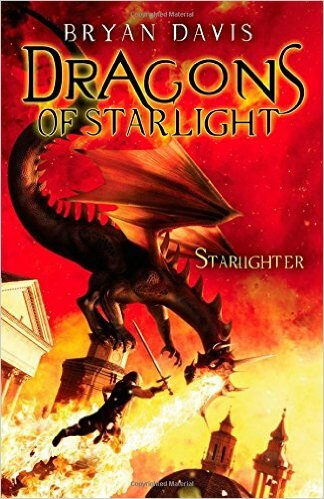 As I said in my review of Dragons of Starlight, I would suggest completing Dragons of Starlight before reading Tales of Starlight, just because it is easier to follow each series on its own without trying to juggle everything that is happening. Alternatively, if you are willing to read both series at once in order to gain a more thorough understanding of all facets of the story, this is the author's recommended reading order. These two series aren't just telling one big story about lots of characters. The link that makes them so compelling comes from the bond of brotherhood between Frederick, Adrian, and Jason. Frederick, the oldest, became involved with the Underground Gateway almost immediately. He succeeded in finding a portal to the other world, and left a special message for Adrian which was locked by a genetic code. After Frederick's disappearance, Adrian, the middle child, and his father, Edison Masters, devoted themselves to finding Frederick and helping him succeed in his dream of freeing the captives and bringing them home. 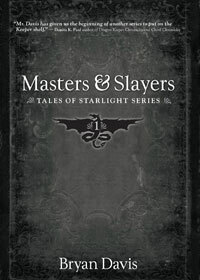 Adrian spent his first book, Masters and Slayers, looking for Frederick while on Starlight. Like his brother, Adrian left a message behind for Jason. Unlike the rest of his family, Jason, the youngest, was not so optimistic about the Underground Gateway. From his perspective, this organization had destroyed his father's credibility and respect, had stolen his brother Frederick, and now had lured away Adrian as well. Since there was no proof that Starlight, the dragons, and the slaves even existed, Jason lacked the passion his brothers and father shared. Nevertheless, when he found Adrian's message, he resolved to find his brothers and help in any way he could, despite his misgivings. Of course, once he reached Starlight and found the proof he needed, he fully embraced the family legacy and devoted himself to ending the tyranny of the dragons. The Masters brothers were very different, and although Frederick and Adrian worked together well, Jason did not share their optimism. His pragmatic, skeptical outlook often brought him into conflict with them. However, they never let their differences cloud their love for each other, and as they faced the most dangerous mission of their lives, they were able to come together and accomplish what they never could have done alone. Thanks for reading! Do you like stories that focus on many characters to give an overall bigger picture? In this series, now that I have covered friends, parents, and siblings, what are some other important relationships you would like me to write about? Let us know in the comments! Thank you! Bryan Davis is one of my favorite authors because of his ability to seamlessly weave together large casts of characters and complex plots. Thanks for these great topics, Hannah. I tend to like books that focus on a small group of main characters, though there are plenty of books I love that follow more characters and have a more complicated plot. Can't think of any examples at the moment, but there are definitely plenty of complex stories like these I love. I love large casts because of the complex and detailed character interactions. Thanks for the comment! Enjoyed your post, Hannah! I enjoy stories with fewer characters, also. However, now that I have taken your advice to keep a family tree, it is easier to enjoy the complex stories with more characters. I agree that families with difficult relationships would be that much better if love prevails. I like books that reflect that theme! Thank you very much! Family trees are very handy. You're right, that is a great theme.